Montage Mountain Ski Resort Scranton, PA - is in the far Northwestern Poconos and has 26 trails, 7 lifts, 1000' drop, lodge, night skiing 7 nights a week, 2 terrain parks, snow tubing area 10 chutes, variety of terrain - 1 mile and just close enough to still be in the Poconos. Montage hosts a cafeteria (with Johnny Rockets, Starbucks, Geraldo's Pizza, and Ben & Jerry's Ice-Cream), a lounge, fireplaces, lockers, Accessory Shop, Ski Rental Center, Snowboard Rental Center, Skiing and Snowboarding School, Group Sales Office, Guest Services and Ski Patrol. 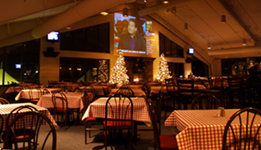 Montage also boasts Slocum Hollow Bar and Restaurant with entertainment, drinks, delicious food, and a great view of the slopes! Located in Scranton, PA off exit 182 from I-81. 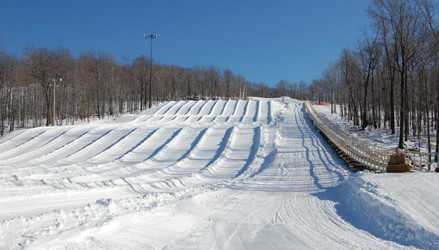 The "Skiing Improvement Center" is for all levels of skiers from first-timer's to advanced racing and freestyle levels. As at Shawnee skiers can start at age 3 with the SKIwee Program, and for the more advanced there is a NASTAR racing program. 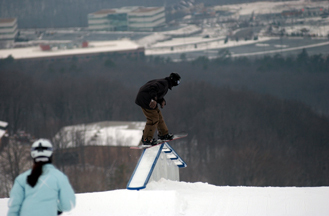 The mountain is open to snowboarders, but they have a Freestyle Snowboarding Fun Park, and a 500-foot half-pipe. 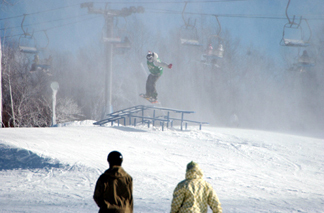 Montage also offers instruction in both skiing and snowboarding. There is also: child care, group ticket discount program(s), ski and stay discount lift tickets/hotel reservations,a full-service rental shop, and ice skating at nearby Lackawanna Stadium. Montage Ski Resort is just outside of Scranton, at Exit 51 off of Interstate 81.